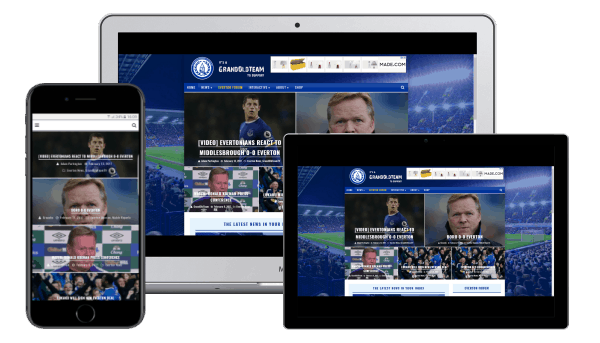 GrandOldTeam is the leading destination for fans of English Premier League Everton Football Club, and you can benefit from the 6,000,000 to 12,000,000 monthly page views that GrandOldTeam.com receives per month through advertising. GrandOldTeam is award winning, widely recognised as being the very best at what we do. Sky Sports cite our news and interviews, and national newspapers use our platform to demonstrate fan opinion. GrandOldTeam is a global brand. Our visitors are drawn from over 80 countries across the globe, primary markets being the UK (75%), United States (7%), and Ireland (5%). 6-12 million monthly page views. Display, Editorial, Takeover, Desktop, Mobile, iOS App, Android App, Content Solutions, Co-Branded Campaigns and more.